Color-Position Light Signals - If your railroad operates more than one train per track, to reduce the chance of a collision you need signals. 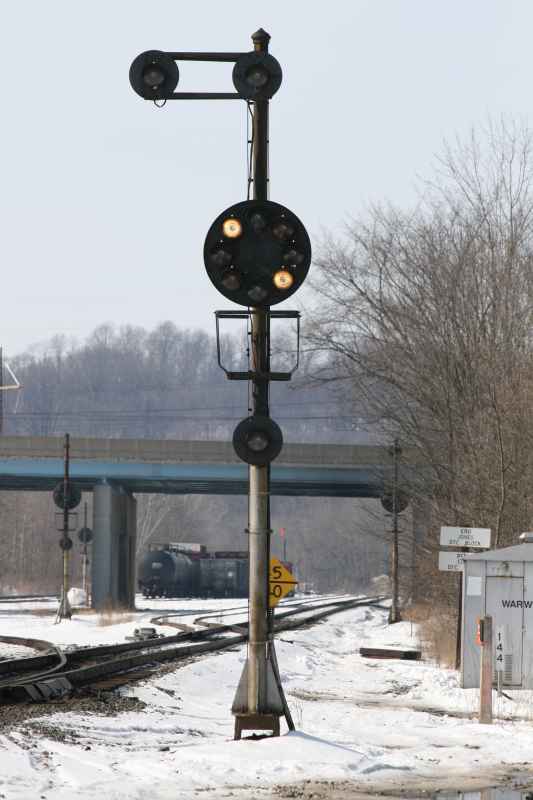 Signals improve safety by advising an engineer of the trains ahead beyond visual range. The oldest train signals were operated locally and manually, but when electricity became available trackside, labor-efficient remote operation of signal motors and lights became possible. 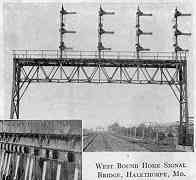 Over time various rail companies have implemented many different signal designs. 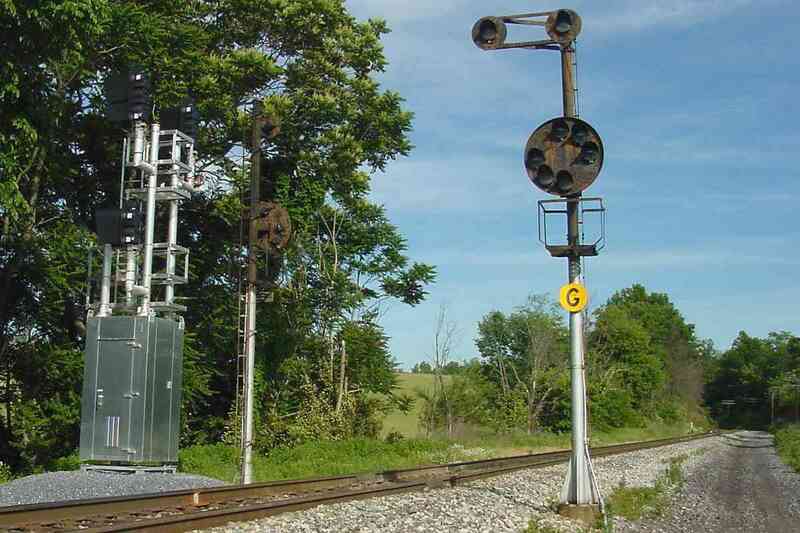 Though Color-Position Light signals (CPLs) are the B&O's classic signal design, for rail system standardization purposes they are being phased out by CSX. By 2013 most if not all the CPLs illustrated below have been replaced with in-line color light versions. If this CPL primer page whets your appetite, at the bottom are links to sites with more details and larger photos. A CPL consists of a circular, fixed black disk, or signal head, containing up to 8 lamps. 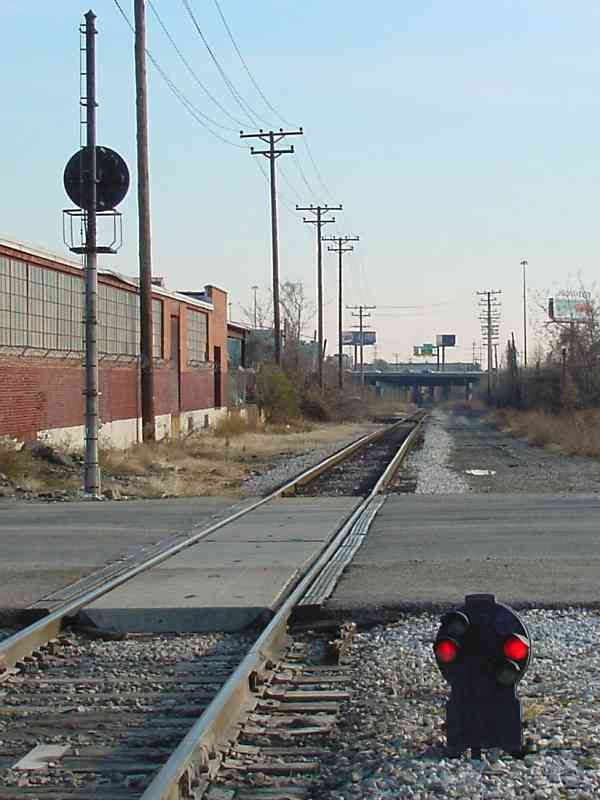 The most common CPL configuration, such as the two seen here at Bailey's Wye in Baltimore, has six lamps on the signal head plus at least one marker lamp above and/or below. Rather than marker, some people favor the term orbital. The signal head does not rotate, instead pairs of lamps are illuminated to represent 3 basic instructions: go, stop, or go slow. Each such pairing is called an aspect. The top and bottom lamps display green for "clear" (go), the left and right display red for "stop", and the ones illuminated in this photo display amber for "approach" (slow). There is redundancy in the system: though in this photo the amber looks red, since the illuminated lamps are the / diagonal pair can we know it depicts "approach" rather than "stop". The vertical, horizontal and diagonal pairings mimic the arm angles of the semaphore-style signals that preceded the CPLs. CPLs come in two sizes: full and dwarf. 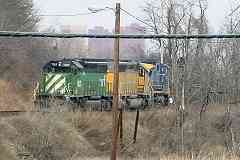 Dwarf CPLs are employed where multiple tracks run parallel and trains often stop, such as sidings and rail yards. Their small size lets them be placed closer to the track they control, with the goals of better nearby visibility and reduced confusion for the engineer. 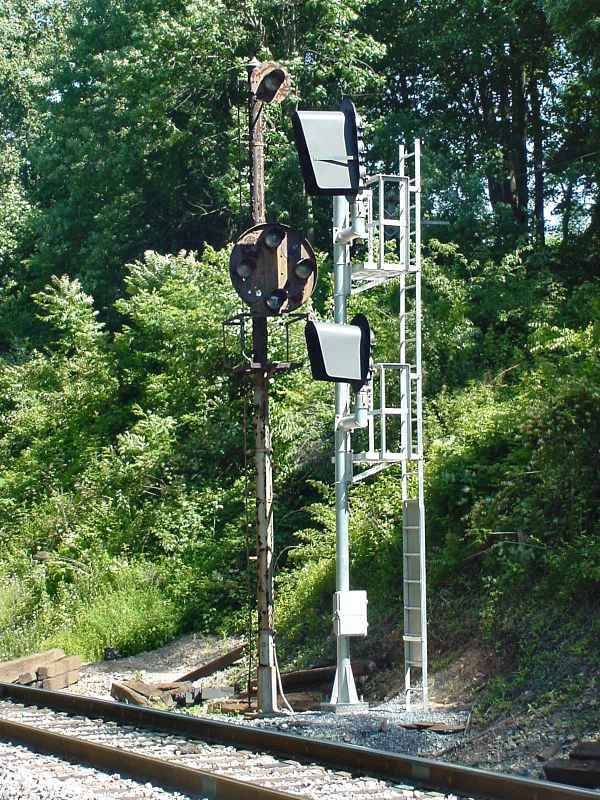 B&O specifications call for full-size CPL signal heads to be pole-mounted 17 feet above the rails, with marker lamps (if any) 7 feet above or below. Dwarf CPLs are placed about 1 foot off the ground. Lamps are omitted for aspects that will never be displayed at the location. 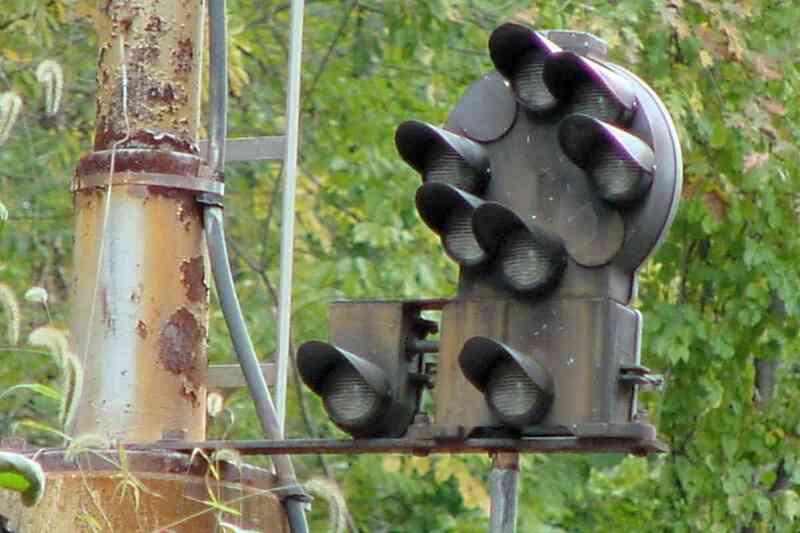 Since trains are never given a full-speed "clear" indication here at the Washington Boulevard grade crossing, there are no lamps at the top and bottom of this signal head, and this becomes a 4-lamp dwarf. 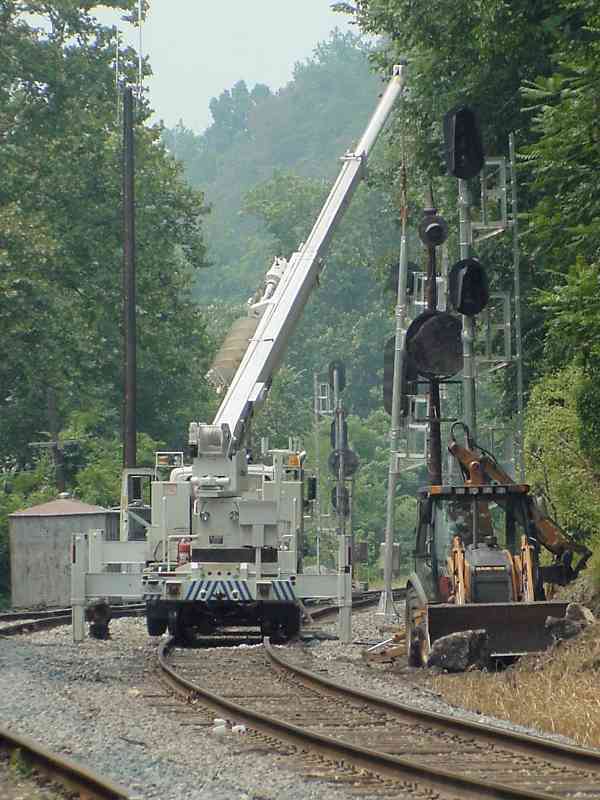 The B&O's choice to customize the signals at each location rather than simply install one of standard design reflects the past when labor was relatively less expensive than equipment. The full-size CPL across the street is also a 4-lamper. 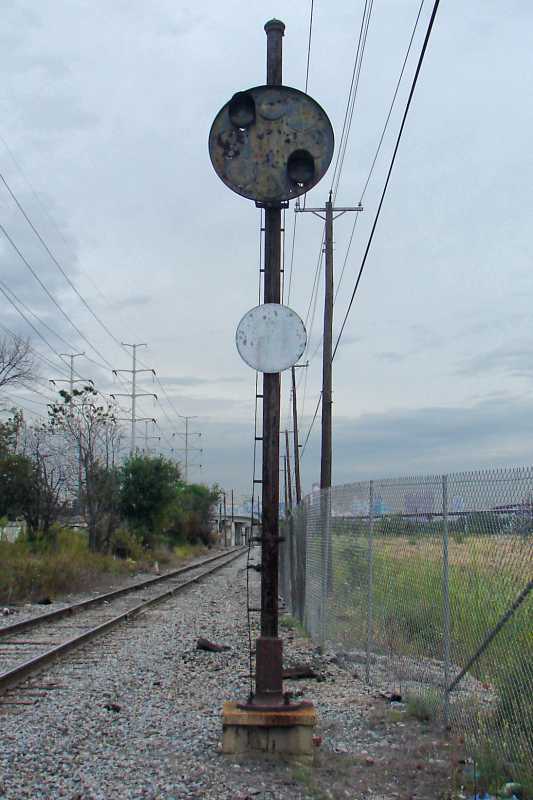 Rarely are dwarf CPLs mounted higher, here's one at Huntingdon Avenue in Baltimore. 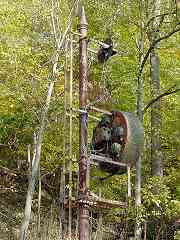 When better visibility is required due to hills or visual clutter, the CPLs are mounted high on towers, such as this seen from 1/3rd of a mile away. 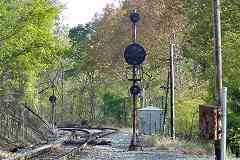 Each of the three tracks here has a corresponding signal. 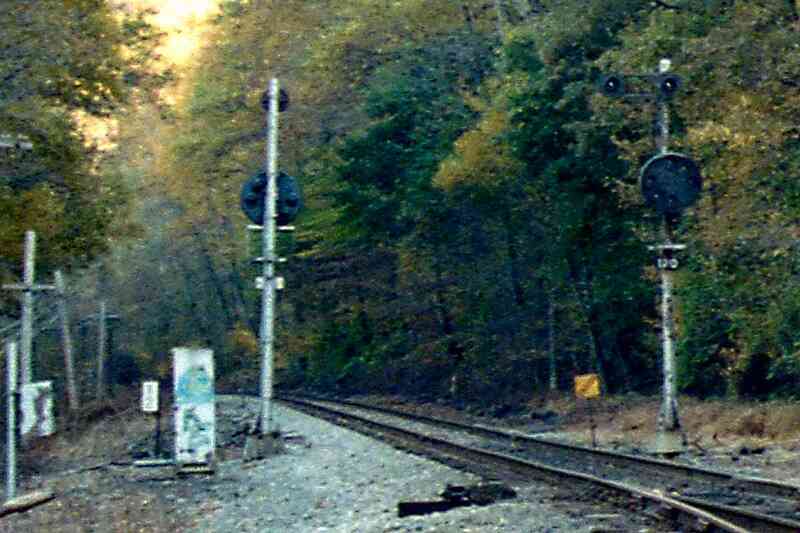 The center track shows the rarely-found maximum CPL lamp configuration: 8 lamps on the head, plus 3 marker lamps above and 3 below. To reduce energy consumption and extend lamp life, the lamps are lit only when a train is near, something called "approach activated". Crossing over the tracks teyond the signals is Interstate 95. The view back from the other side of Interstate 95 shows a CPL tower of a different style about 1/2 mile away. The green aspect means "clear" and the white marker above means the train can proceed at high speed. In general, lit marker lamps modify the meaning of the basic aspect, usually to indicate a faster speed is allowed. 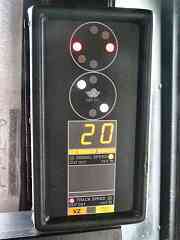 An example: the main signal head gives the primary instruction, such as "approach", and the marker lamps add details, such as "medium speed". The terms are then combined -- "approach medium" -- and each combination is assigned a Rule number in an operations rule book. Approach medium is Rule 282. One of the red lamps has burned out on the signal controlling the track at right, redundancy comes to the rescue again. Near the top of the photo, and roughly two miles away, is Oriole Park at Camden Yards in Baltimore. Now that the signal has been passed by the locomotive, it changes to red because the simple electrical system of signal blocks does not realize the consist (the cars following the locomotive) are part of the same train. 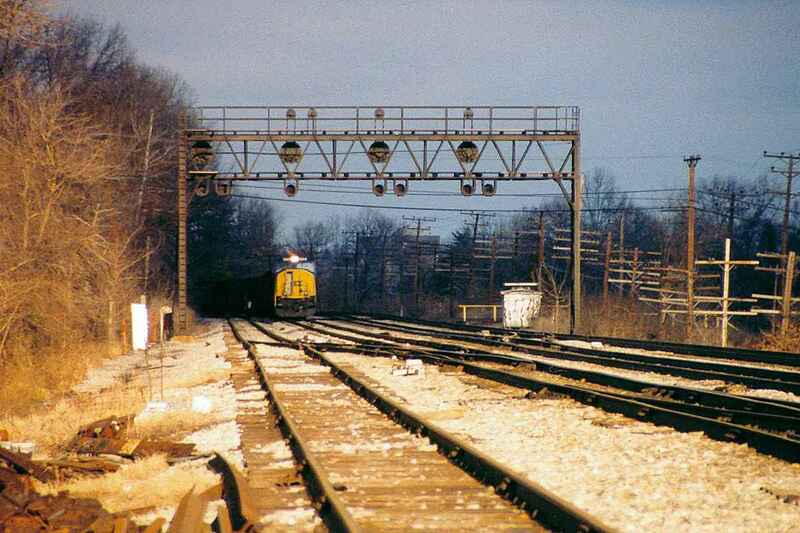 Once the last car passes the signal, it will go dark (unlit) unless a different train is following close behind. "It is fallout from the MARC accident in Silver Spring, and tells push-pull trains to approach the next signal (assumed to be absolute) at medium speed. See this link: Bull sheet." 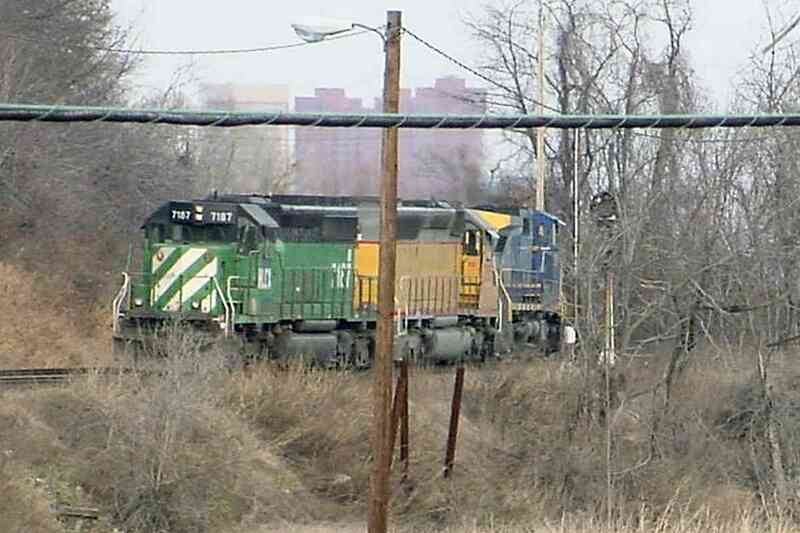 The over-magnified photo above shows a distant CPL depicting the "lunar" or "restricting" aspect (\ upper-left plus lower-right lamps) as three locomotives pass. Restricting is the rarest spect to observe because few CPLs are equipped with the lamps for it. The instruction is employed to indicate the track ahead is unsignalled, and therefore the engineer must be ready to stop for any obstruction he observes. The term lunar is employed because the light color is similar to that of the moon, and is accomplished by a light-blue lens. The lamps themselves are incandescent so the emit a yellowish color which is modified by a lens. The lens that produces green is actually blue in color since yellow tinted blue yields green. The example photo at right comes courtesy David Malohn. The dwarf CPL discussed above has lamps for the lunar, "restricting" aspect. It is the only 4-lamp dwarf so equipped I have seen anywhere. A CPL with only a restrictive (lunar) aspect is a rare beast. This one survives adjacent to the Westport Light Rail station along a branch that allows Curtis Bay traffic to head north into and beyond Baltimore. 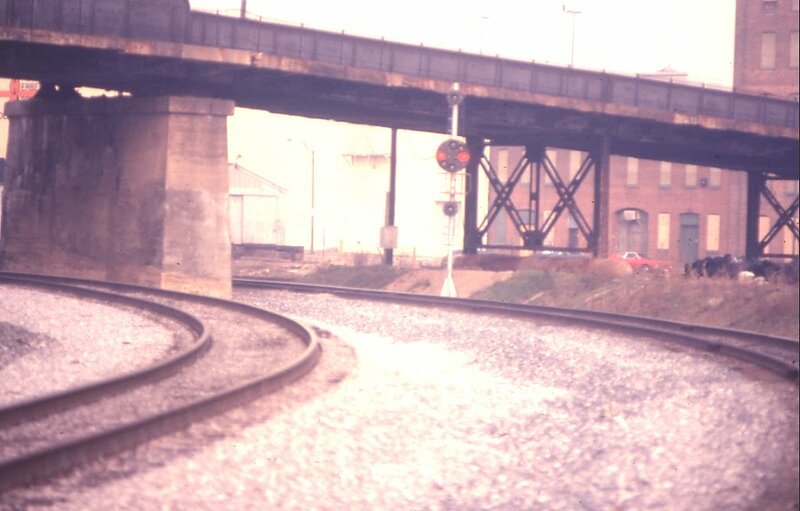 The faded P sign ("permissive") modifies the signal to allow tonnage (heavy) trains to proceed at restricted speed without first stopping. The tall buildings in the distance are around Baltimore's Inner Harbor. Notice that the CPL on the left has a marker lamp above while the CPL on the right has a marker lamp below. 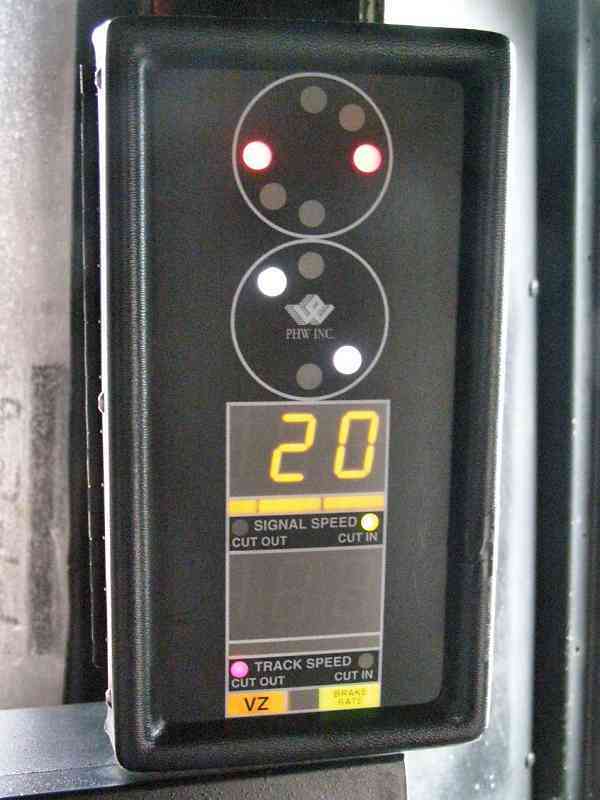 Both the higher and lower markers when lit increase the speed allowed: the higher marker allows high speed, the lower allows medium. If none are lit, a slow speed in required. The miles-per-hour value for high, medium and slow are dictated in a rule book. 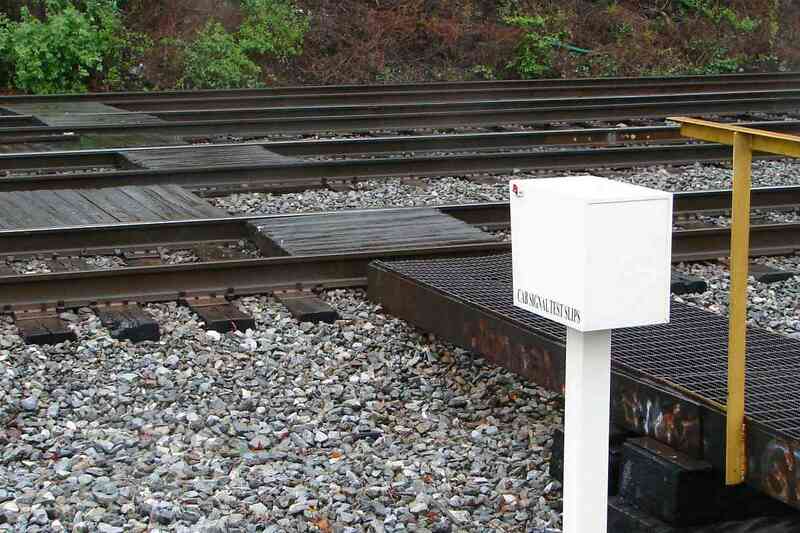 The CPL on the right is an 8-lamper, a variety installed in only a few locations, commonly when approaching a rail yard. 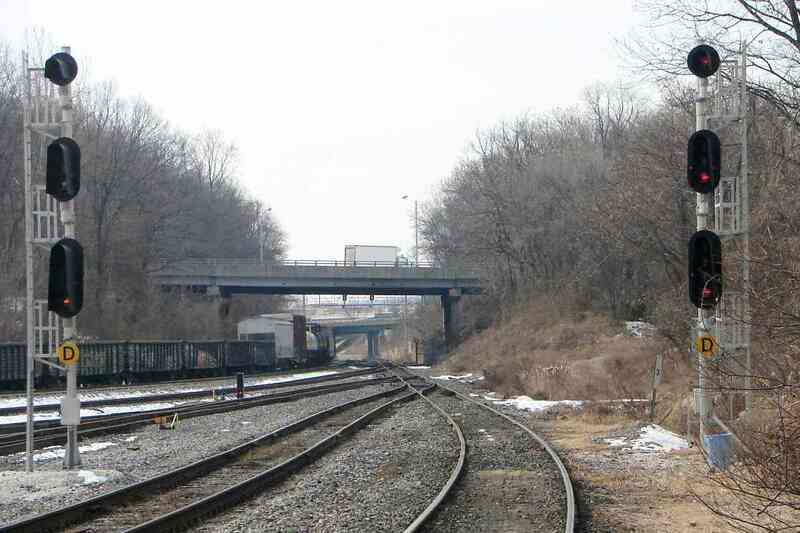 The track in this example leads to Claremont Yard, the Carrollton Viaduct, and B&O Museum. TOFC usually stands for Trailer On FlatCar, but has an alternate meaning in this photo. A trackside pole was the most common CPL mount, but they also appeared cantilevered and via what I call candelabra. 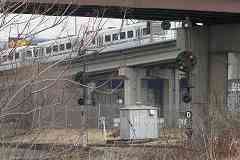 This spot is known as West Baltimore; that's Patapsco Avenue passing overhead. 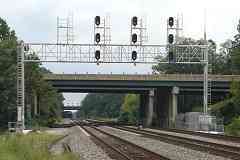 By 2011, the CPLs of the prior photo had been replaced by these in line color light signals. Even the dwarf CPL got a small replacement. 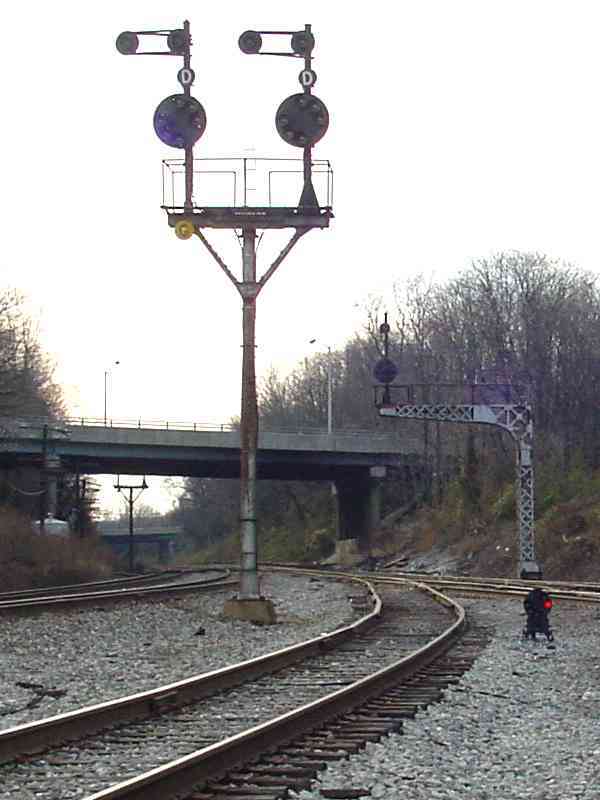 With the CPLs being phased out, during 2009 CSX conducted a test of Cab Signals. 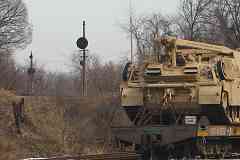 At Halethorpe engineers could stop to pick up test paperwork. What are Cab Signals? See the photo below. To help the engineer see and remember the state of the trackside signals, cab signals replicate their display inside the locomotive. In the United States, the Interstate Commerce Commission began requiring cab signals during the 1920s. 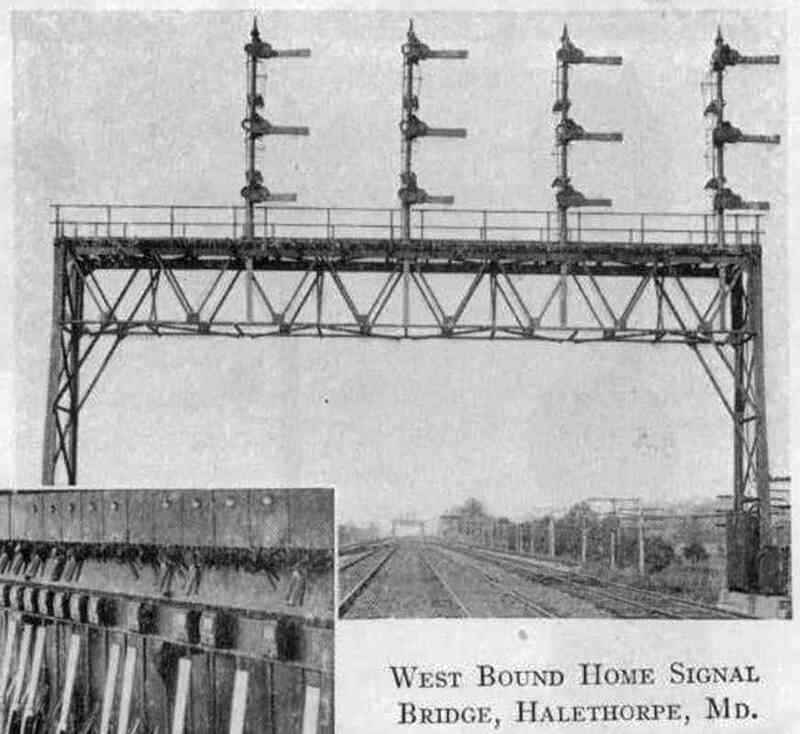 I am surprised that almost a century later we still have trackside signals... if all locomotives have cab signals inside, why bother with trackside ones? Perhaps those trackside are required by yet another regulation. 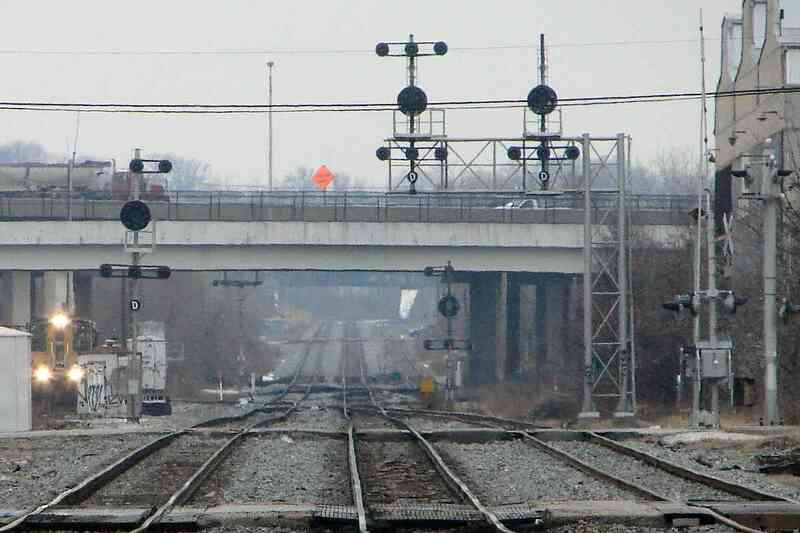 Where many mainline tracks run parallel, the signals are mounted across what is called a signal bridge. This one in Halethorpe is no longer extant. 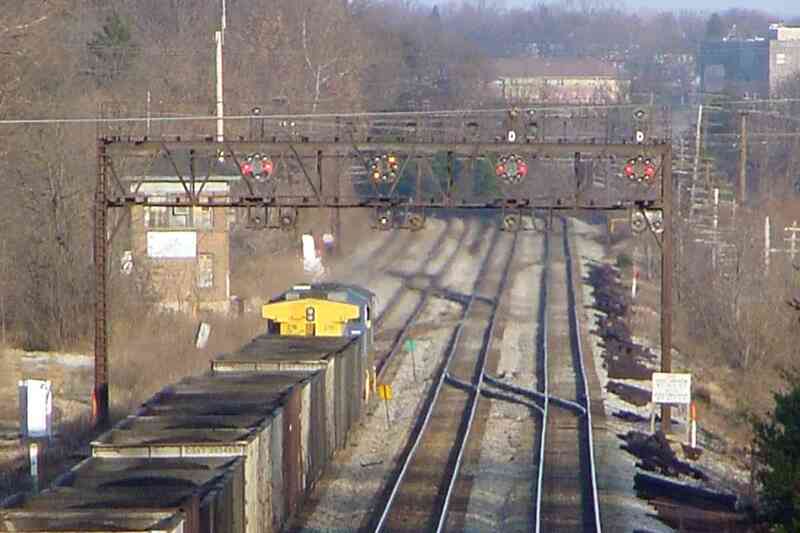 This is the same signal bridge as viewed from the opposite direction when semaphores predominated along B&O trackage. CPLs were invented during the 1920s. 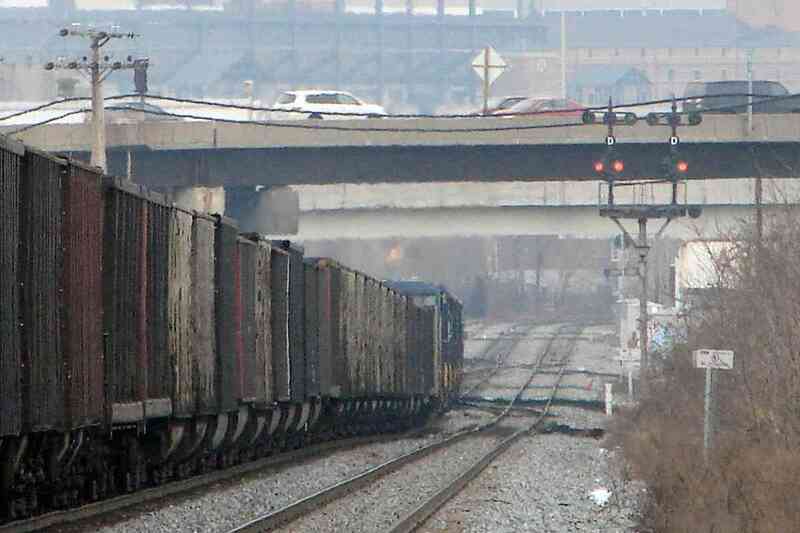 A coal drag is signalled to proceed into Baltimore. Note the eight-lamp CPLs with various quantities of marker lamps. Through the haze and distortion, HX Tower is visible at distant left. As suggested by the signals and tower, prior to centralized traffic control, this area had been of prime switching importance to the B&O. 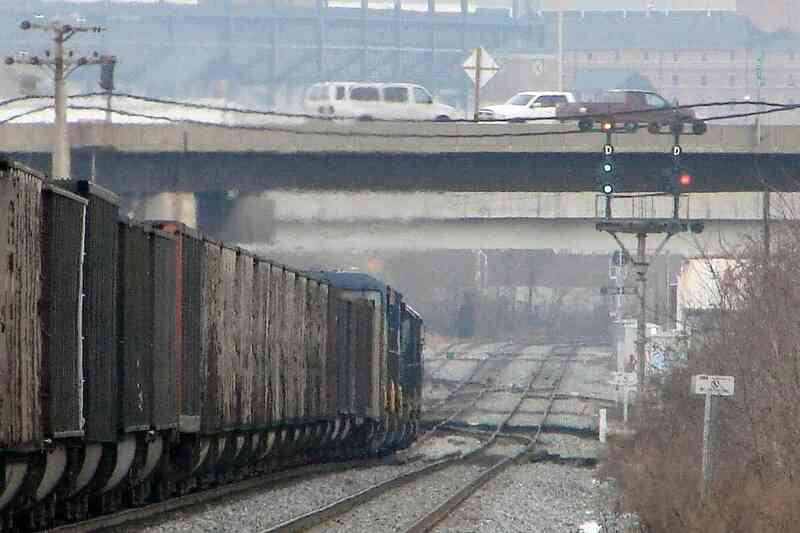 Now all CSX train movement happens under the authority of the company's central control group in Jacksonville, Florida. 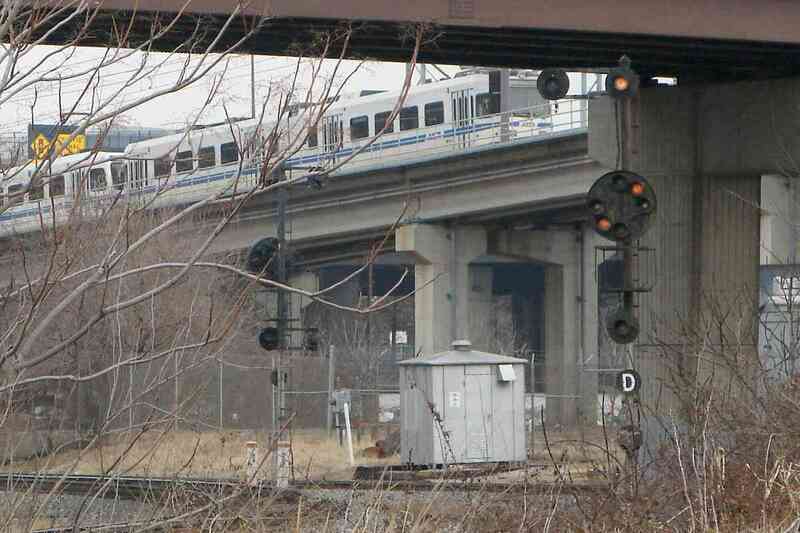 In 2005 CSX began construction of a new signal bridge a short distance west of Halethorpe at St. Denis. The new bridge is 4-track ready. I have yet to decipher these signals: all red clearly means stop, but I do not know what the amber-green-red combo indicates. The new design appears to lack the redundacy that CPLs provided for the most critical part of signalling: stop or go? Notice the cylinder perched to the right of the signal head of this rusty CPL at the east end of Avalon siding... that is known as a doll post or doll arm. A doll arm tells the engineer the signal does not control the nearest track, but rather some other. The signal is perched higher than usual so if two trains are side-by-side, the engineers of both can see the signal. If a dwarf signal is found below, it controls the near track. As hinted by the doll arm, a dwarf signal is found at the base. Like their full-sized cousins, dwarf CPLs can have marker lights too, for a maximum total of 14 lamps. The oldest CPL poles, perhaps those converted from semaphores, were topped with a decorative finial that likely also functioned as a lightning rod. 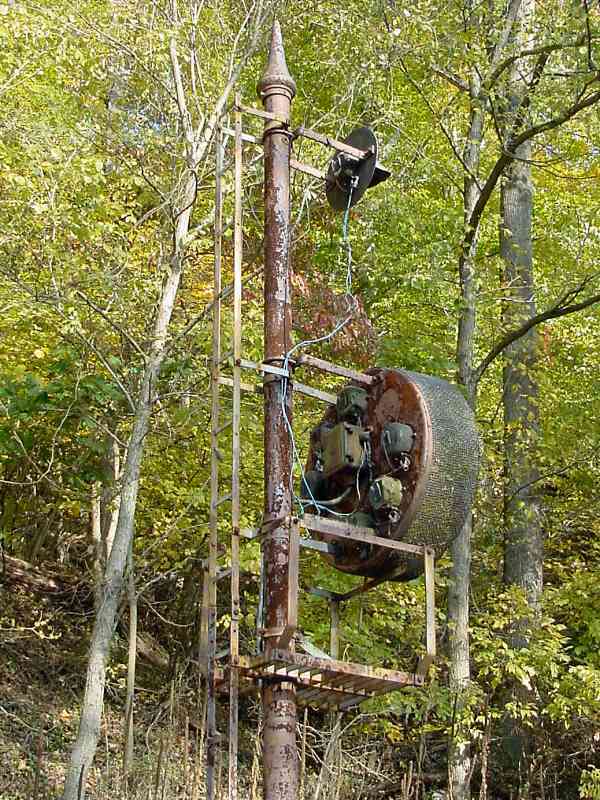 The main signal head of this CPL is protected by wire mesh because this location is frequented by Patapsco State Park visitors who like to throw stones. 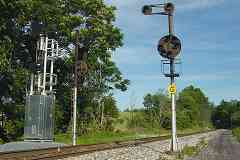 The "basket" enclosure below and behind the signal is a platform that facilitates repair. In with the New. 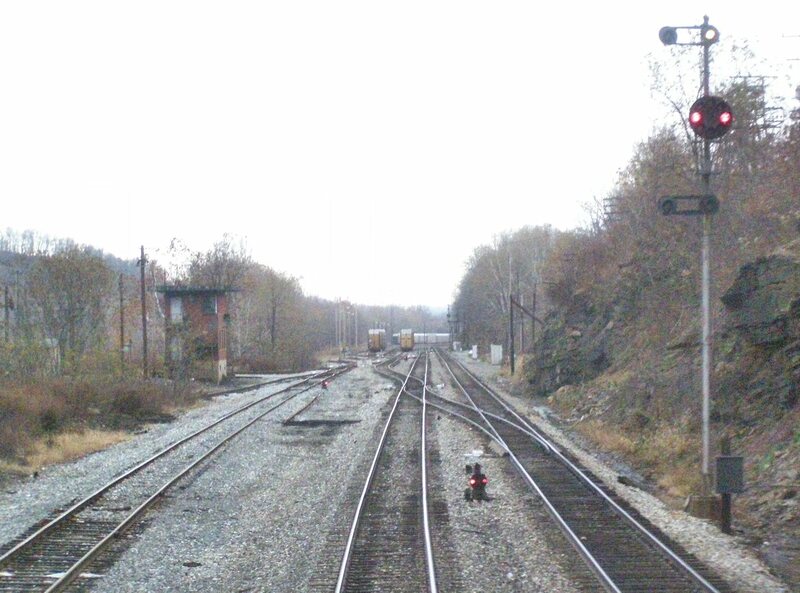 Note also the dwarf CPL between the tracks. This CPL with two marker lamps had guarded the west end of Avalon Siding. The main head disk is 3 feet, 4 inches in diameter. 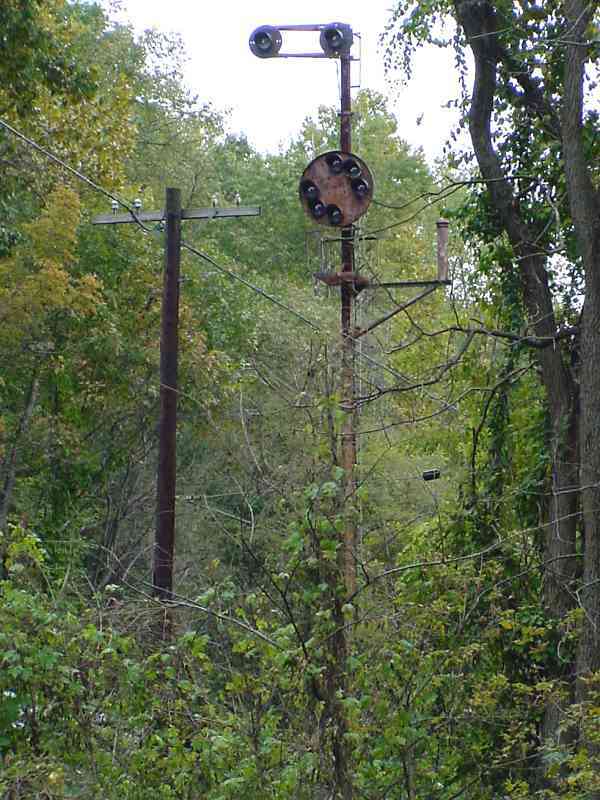 Signals are typically located where they can be seen from a distance, and the most common mounting along the OML was a steel or aluminum pole like this. The lack of decorative finial at top suggests this CPL is not an original, and its placement where the OML's second track had run before 1950 confirms. 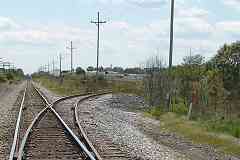 When the OML was converted to single track, short sections of double track were preserved as sidings. 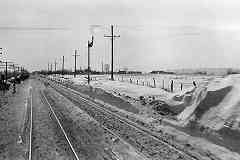 The wooden poles carry disused communication lines that had followed the right-of-way for more than a century. 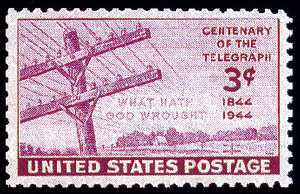 The first telegraph line was built along B&O tracks between Baltimore and Washington. 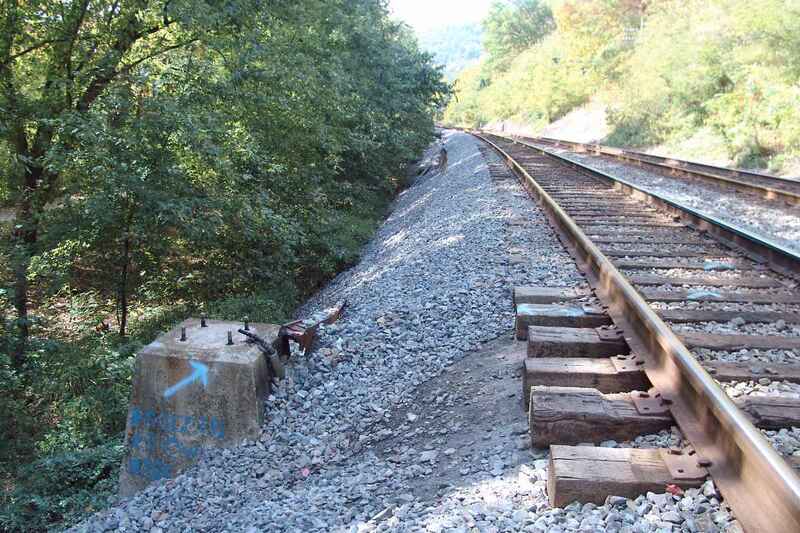 As CSX has replaced the CPLs, it has also pulled out these poles. The crash of water over nearby Bloede Dam was easily heard here. Victor Bloede was involved in not only the dam's creation, but also the patent for the adhesive on this postage stamp. Unfortunately, before CSX removed the Old Main Line's CPLs I captured too few quality photos of ones with number boards on them. In this blurry photo you can see a number 120 on the pole at right. The 120 refers to the location by track mile in tenths of miles. At photo bottom left you might discern the milepost 12 sign. A number board means the signal is automatic rather than controlled by a dispatcher, and that alters how it is to be interpreted. At an automatic signal showing the red "stop" aspect, after stopping the train the engineer can proceed ahead slowly if the track ahead is clear. It's similar to a Stop sign for automobile traffic. A signal lacking a number panel is called "absolute" and is similar to a red light for automobile traffic: it means stop and do not proceed without dispatcher permission. This number board photo is slightly better. 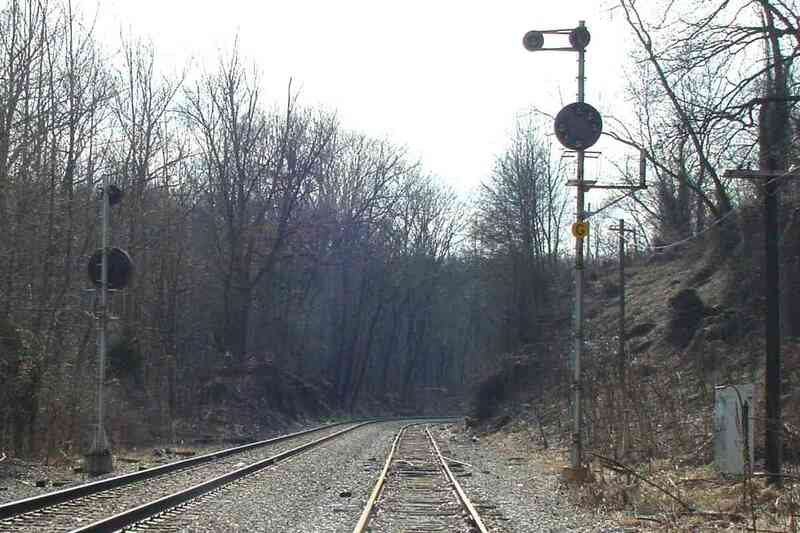 I recall this signal lighting and dimming repeatedly over the course of about 20 minutes but for unknown reason no train arrived. 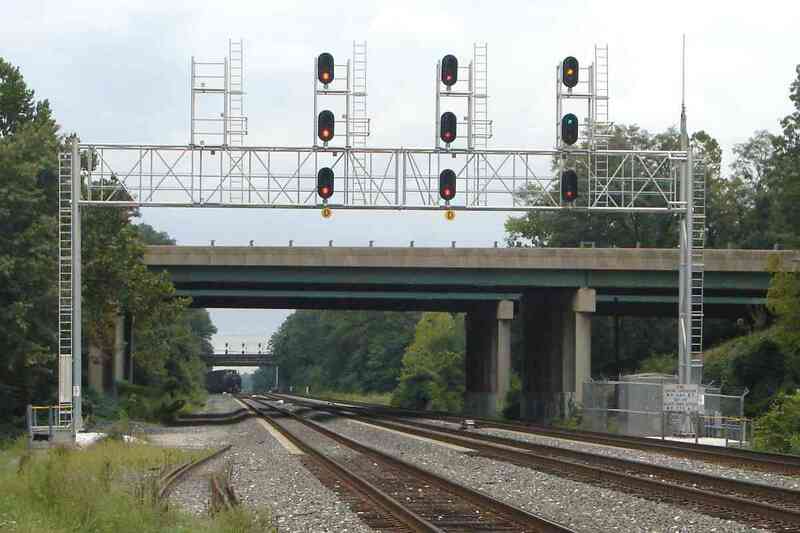 Since automated signals are approach activated, a lit one means a train is located within the block of track that ends at the signal. 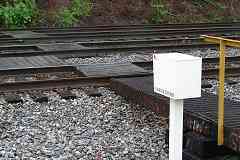 A "block", also called a "signal block", is a basic unit of trackage, often a few miles in length. Under automation, only one train is permitted within a particular block at a time. If a block is occupied by a train, and another approaches, the signal guarding the block's entrance will display a red "stop" aspect. To boost communication clarity for railroad operation, the milepost value on the number boards is nudged so eastbound trains see board numbers that end with an even digit, and westbound with an odd digit. 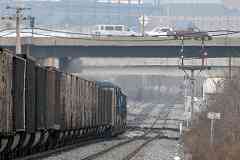 By convention, all rail traffic in the Unites States is considered to be either eastbound or westbound. Assigned train numbers usually follow the same scheme: eastbound even, westbound odd. Several unusual things are going on here: despite the doll arm there is no dwarf CPL to be found (perhaps he's just Bashful). 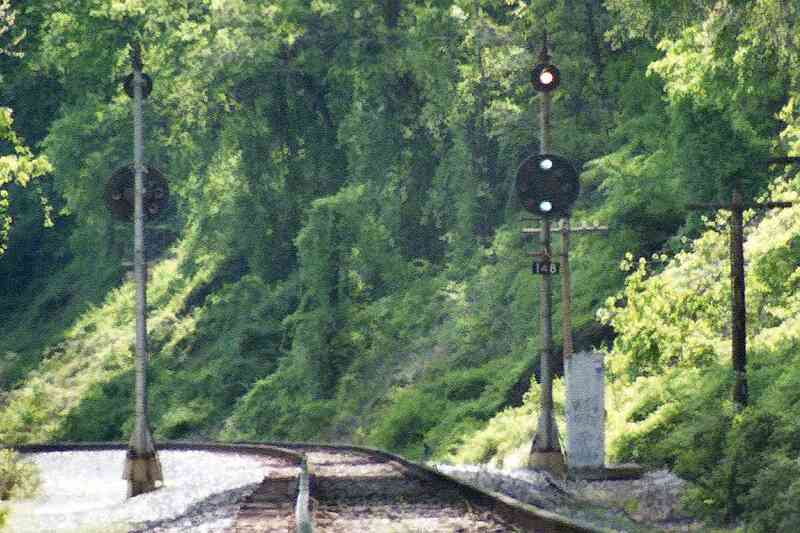 The G sign indicates "Grade" and modifies the meaning of the signallights such that, for example, a train can proceed slowly through a red signal so as to avoid stopping on a hill which might be steep enough to prevent a stopped train from moving again without assistance... there is no steep track here, except for the disused Springfield Hospital Spur atop the hill on the right. This combination suggests this signal might have been intended for the spur! Highly unusual. It's all stop or go for this uncommon 4-lamp CPL. In the photo from 1982 linked below, this CPL has only stop and lunar aspects! The uphill trek over Parrs Ridge warrants a G (grade) sign while shiny, new signals wait their chance. As described above, lit marker lamps increase the speed allowed. The marker lamps can also blink on and off; when they blink, a limitation is in effect, the details of which are in a rule book. 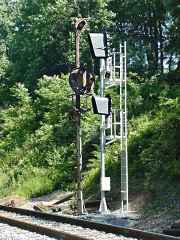 At least some OML semaphore signals survived into the 1950s. 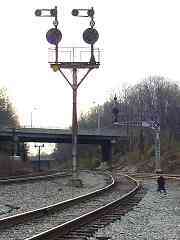 The last B&O semaphore in Baltimore remained in operation until 2006. 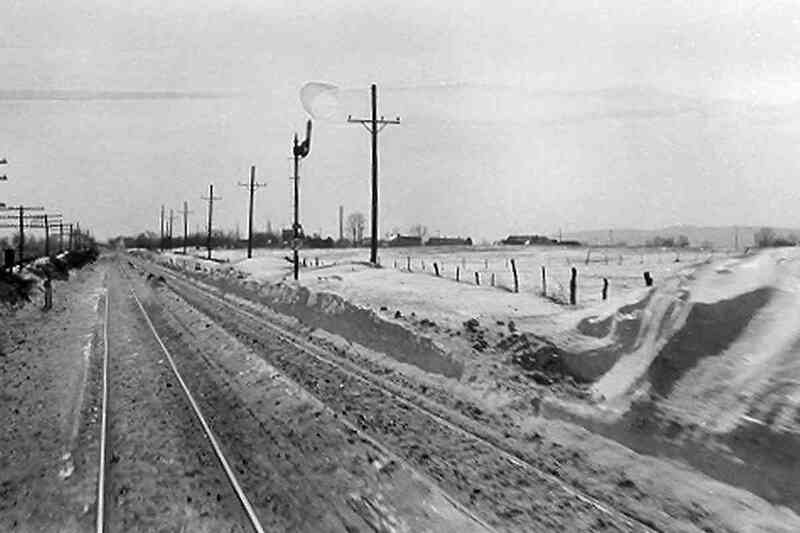 Note the smokestack in the distance to the right of the signal. That's where the Alpha Portland Cement company can be found. In the view from about the same spot some 50 years later the signal is gone but the stack remains, now behind taller trees. The OML had at least some CPLs by the 1940s but it seems the semaphore was removed rather than replaced. 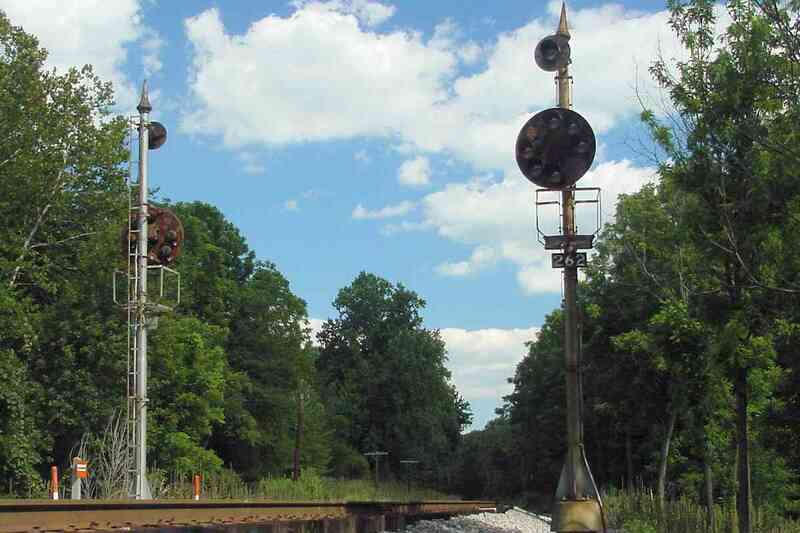 Periodically railroads adjust the locations of signals in response to traffic patterns, and the cessation of OML passenger service in 1950 may have doomed the signal. 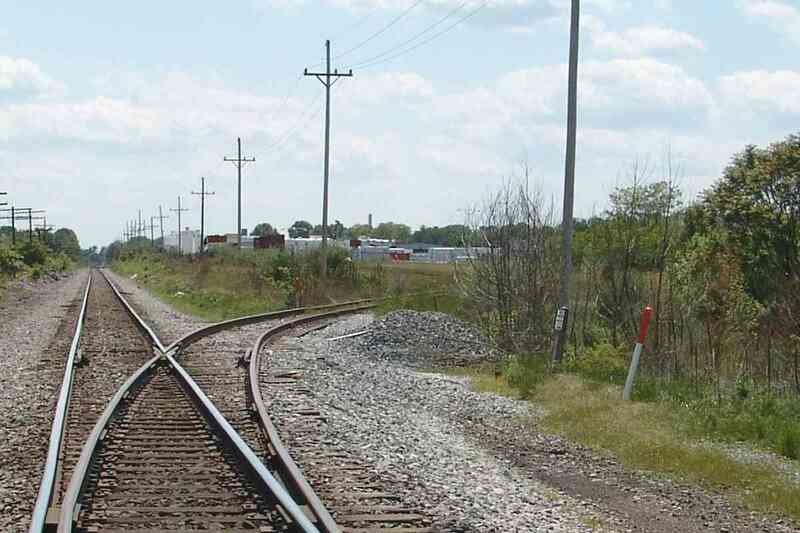 The siding in this photo leads to the McKinney Industrial Park. The rust may get scraped off this siding because in 2013 the industrial park is scheduled to be the site of a new waste-to-energy incinerator. Dozens of these disused concrete stands now act as trackside CPL graveyard markers along the routes toured by this site. Another popular design you'll see is circular with a hollow center. The CPLs may be gone, but they are not forgotten. you may enjoy Todd's RR Signals, Sturmovik's CPLs at Carroll, and The Position Light.